After working on many different crochet projects for the past 14 years, I have quite a stash of leftover scraps of yarn. Some leftover pieces are big enough to use for a small project. Other leftover pieces don't go far, but I want to use up all of the scrap yarn I can. I only throw away yarn if it is less than about two feet long. Here are some ways I use up my yarn scraps. 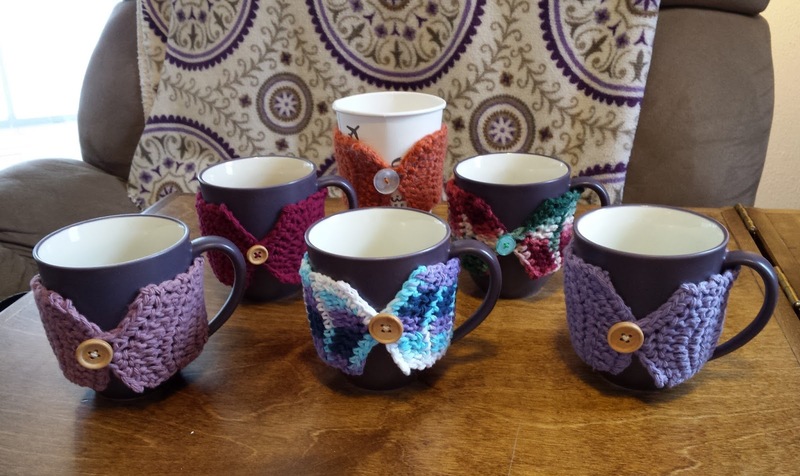 I make cup cozies. I have tried a few different patterns, but this one has turned out to be my favorite for looks, function, and ease of making it. It is made by alternating rows of single crochet and double crochet stitches and then adding a loop for a button on one end. These are nice to give away as a small gift to friends and teachers. I don't know how much they actually help to keep coffee or tea hot, but they are fun to use. I make crocheted hairband covers. I like the way these feel in my hair when the original hairband is completely covered. 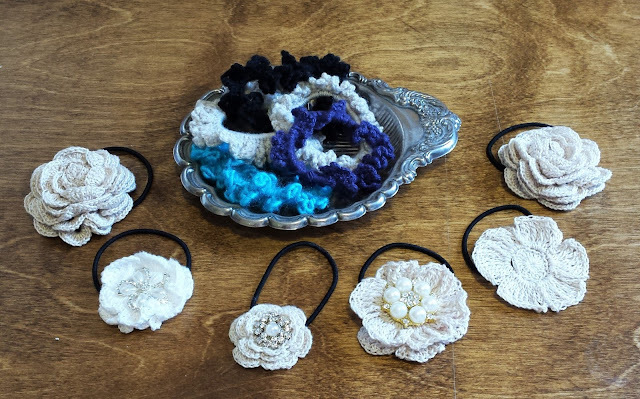 I have also made flowers and then sewed them onto hair bands for Adelaide. I let her pick out jewels from my craft stash to sew on some of the flowers. 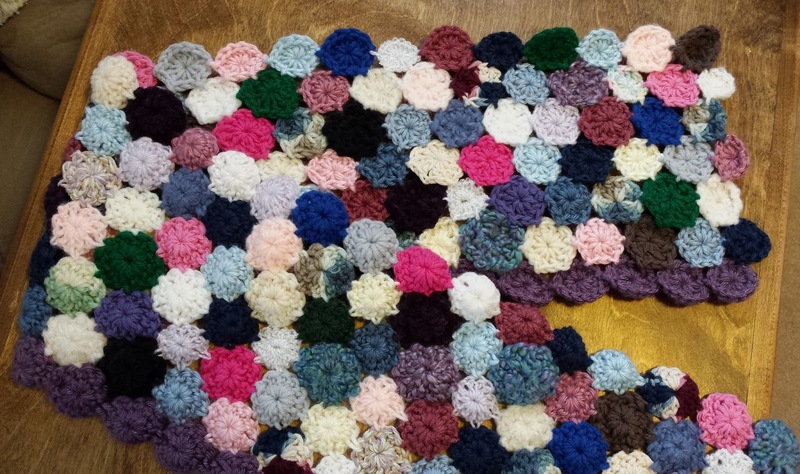 I am slowly making a Sea Penny Afghan. I learned how to make sea pennies from Julia Crossland. I started making this blanket about five years ago, but I haven't worked on it for about four years now. I need to pick up my scraps and start making sea pennies again! I hope to make this into a nice lap blanket size. This will not be a color coordinated afghan, but it will be filled with memories. I am making sea pennies using leftover yarn from almost all of my crochet projects. I am also using some of my Oma's leftover yarn. 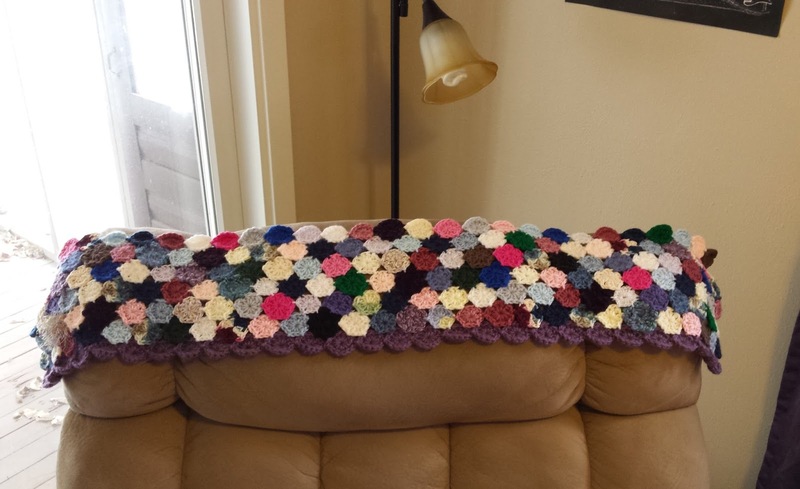 It is fun to look through the all of the colors and yarns in this sea penny afghan and remember the specific projects and people and gifts they represent. I would love to hear your ideas! How do you use bits of leftover yarn? Please share your scrap project ideas and patterns!